Swiss Alps Bakery and Cafe is a local fine bakery in the Albuquerque Northeast Heghts. They started out as a wholesale bakery and added cafe and coffee services when moving to current location. Project Info: The concept behind this package design echos the old and new concept of Modern Baked Classics. 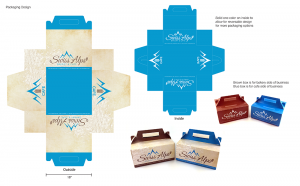 The idea was to have two - double sided boxes that give the bakery 4 different design options out two boxes to get more milage for packaging and marketing. 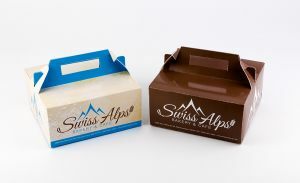 The blue design would be used for Cafe for such things as to go orders or bos lunches. The brown design would be for Bakery side and would be used for baked goods such as pastries and other bread broducts.